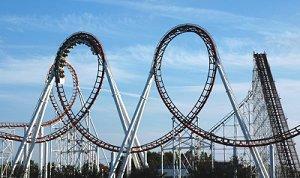 Check out this Roller Coaster photos slideshow for ideas! If you're a thrill-seeker and you want to build your own roller coaster, there are many different options to try to create an amazing scream machine. Building a roller coaster can be a fun hobby or it can be the basis of an innovative science fair project. Teachers may use roller coaster projects to demonstrate the physics of roller coasters or to encourage students to investigate structural integrity, schematic design, teamwork, architecture, and drafting. A hobbyist, on the other hand, may enjoy the exquisite detail of a finely crafted coaster model, and accurate scale models can be lucrative items to sell to the ever increasing crowd of coaster fans. Whatever the reasons to build your own roller coaster, however, the process will not be an easy one but it can be as rewarding as riding the most amazing coaster in the world. Working Models: These meticulously designed roller coasters actually race through their tracks, and some may include motors to power authentic lift hills and other mechanisms. The KNex roller coaster models are working models, and other toy companies have created similar kits for eager enthusiasts to design their own rides. Stationary Models: These detailed models are stunning recreations of famous rides or innovative new designs, but they do not actually move trains through the tracks. These are frequently used as decorative pieces or may be housed in amusement park's historical centers, such as the model of the Blue Streak that can be found in the Town Hall Museum at Cedar Point amusement park. That model, and many others, can be found at RollerCoasterModels.com. Homemade Models: These are the classic science fair types of roller coasters, often constructed from popsicle sticks and marbles. Any types of materials can be used to create a reasonable facsimile of a roller coaster and this type of freeform design can be very rewarding and challenging. Simulation Games: Another way to build coasters is to play roller coaster games that include park scenarios and coaster building objectives. Roller Coaster Tycoon is one of the most popular simulation games that lets players build coasters, but there are several other titles available with similar game modes. Backyard Coasters: These are a dangerous type of real roller coaster to build that should only be attempted by qualified individuals experienced with general construction and the necessary engineering principles to create a safe ride. Some of these coasters use a roof as the highest point before a meager drop, a couple of dips, and a turn or two, while other designs can be more complex if sufficient land is available. Be sure you have the proper tools. Once you've decided on the type of roller coaster to build, the most important thing to remember is to be patient. A roller coaster is an incredibly complex machine and much trial and error may be required before a working, safe coaster is designed. Feel free to experiment with outrageous designs, since material cost is not a consideration. Save designs frequently or take notes on successful coasters in order to recreate them when desired. Work with different simulation models to learn about different types of coasters and how different construction factors affect their performance. Choose construction materials that will be easy to work with - toothpicks, balsa wood, pipes, clay, popsicle sticks, foil, and even pasta are popular options. Anchor the base of the model firmly to provide sufficient support as the coaster operates. Start with simple designs to learn key concepts before attempting more intricate models. Connect model kits together for more elaborate designs. Keep small parts and tools away from young children, and keep partially constructed models out of reach of eager hands and pets. Keep the coaster's track as smooth as possible for greater success. Test the track frequently as small sections are added to ensure success when the track is fully assembled. When you build your own roller coaster, you control the level of thrill you achieve - whether it's from mastering an online coaster simulation or creating an intricate and realistic model of your favorite ride. No matter what the end result, however, it will be a fun ride to get there..